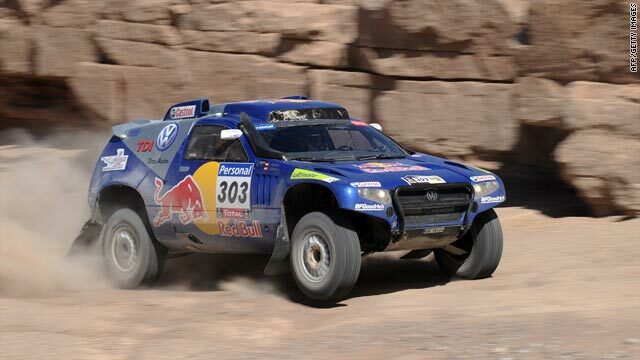 Carlos Sainz will try to hang onto his lead and claim his first victory in the annual Dakar endurance event. (CNN) -- Carlos Sainz was furious with teammate Nasser Al-Attiyah after the Qatari driver slashed his Dakar Rally lead going into Saturday's final stage in Argentina. The Spaniard was left just two minutes and 48 seconds ahead of his fellow Volkswagen driver after finishing fourth in Friday's 13th stage, having been in front by 5:20 before the start, and the two-time world rally champion was quick to blame Al-Attiyah's aggressive tactics. "Nasser was behind. I was passing by bikes and so was he -- we were in the dust," Sainz, who is seeking his first Dakar title, told the race's official Web site. "At one point he passed me and hit me, and then -- when he was in front of me - he started zigzagging in front of me. This is not fair play at all! If I had seen him in my rearview mirror and if I had started doing the same, he would not have passed me. "Two days ago, I stayed in the dust for 120km. What is absolutely not normal is that a teammate would hit you. No, I don't think I have won the Dakar quite yet." Al-Attiyah, who was disqualified while leading last year's race, placed second in the stage as he finished one minute and 21 seconds behind BMW's Stephane Peterhansel. "Sainz didn't let me pass," Al-Attiyah said. "I finally managed to pass him in the last straight stretch. But it's ok. It doesn't matter! It was a very, very fast stage, not technical but I'm pretty happy. We did a good job. The section in the dunes was too short. I will do my best but it might not be enough. If it works, so much the better." Peterhansel has won the race six times on a motorbike and three in a car, but the Frenchman is out of the running this year in fourth place overall, more than two hours behind Sainz. Al-Attiyah is the only driver with realistic hopes of catching Sainz as third-placed American Mark Miller, also in a Volkswagen, is more than half an hour off the leading time. Peterhansel's compatriot Cyril Depres is poised to give France another victory in the bike category as he takes a lead of one hour and four minutes into the final stage, having finished second on Friday. Depres was 43 seconds behind Norway's Pal Ullevalseter, also riding a KTM, on the stretch from San Rafael to Santa Rosa. Ullevalseter climbed up to second overall above Chile's Francisco Lopez, who was fourth. The 206-kilometer final special stage will end near the village of San Carlos de Bolivar in Buenos Aires province.